Eva Oliver is Miss Rodeo Nebraska 2019. She calls Merriman home, where she lives with her parents Chuck and Stacie Oliver. Eva graduated from Cody-Kilgore High School in 2016. She then continued her education at the Nebraska College of Technical Agriculture in Curtis. While in college, Eva was a part of the ranch horse team, Women in Agriculture, Collegiate Cattlemen, intramural sports, STVMA and Phi Theta Kappa. Eva graduated from NCTA with an associate’s degree in veterinary technology in May of 2018. 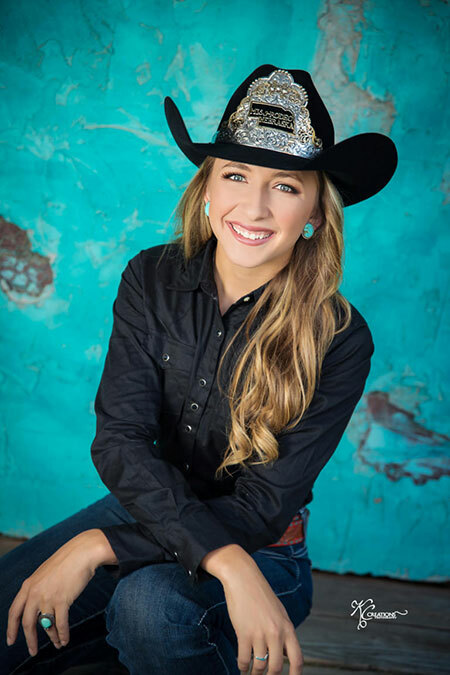 After Miss Rodeo Nebraska, she plans to continue her education and obtain a bachelor’s degree in sales, and eventually, become a sales representative for an animal pharmaceutical company. Eva is currently a part time employee for Shadbolt Cattle Company, where she helps as a ranch hand. From digging post holes to wrestling calves, Eva loves every aspect of ranch life. 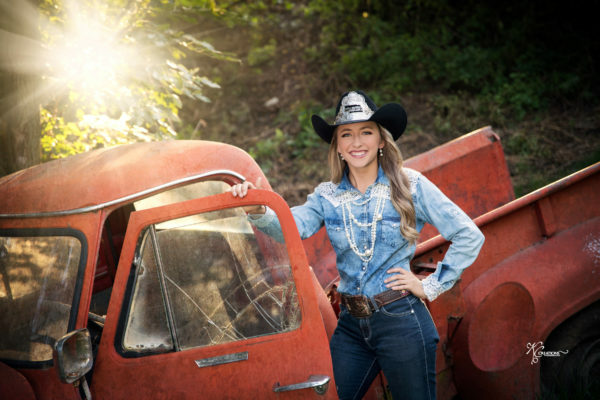 When she is not working on the ranch or working as Miss Rodeo Nebraska, she enjoys starting colts, reading, fishing and competitively playing pitch with friends and family. 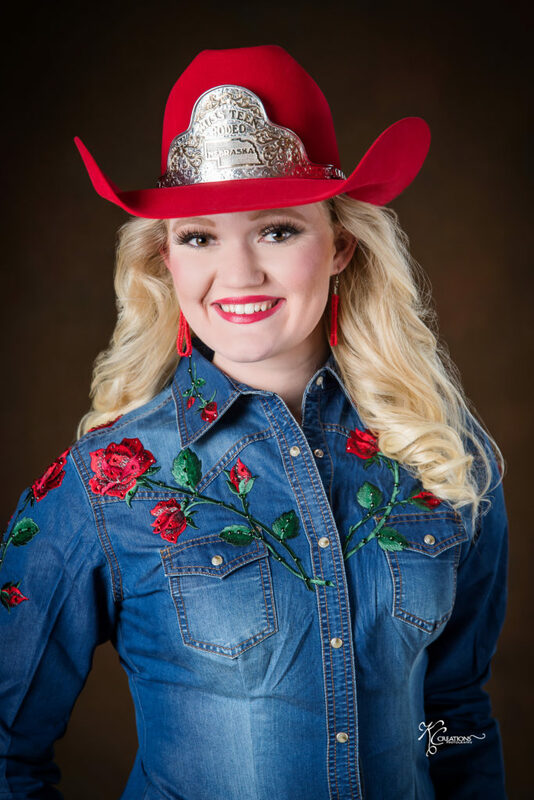 Rebel Sjeklocha is Miss Teen Rodeo Nebraska 2018. The Hayes Center woman was crowned June 13, 2018 at the North Platte Community Playhouse in North Platte. She won the personality, speech, written test and appearance categories of the pageant. It was an exciting moment for Sjeklocha, 17, who came in first-runner up at the pageant in 2016 and 2017. Sjeklocha is the daughter of Rusty and Susan Sjeklocha. She graduated from Maywood High School in May and has plans to attend the University of Nebraska–Lincoln to study Agricultural and Environmental Sciences Communications in the fall. character to promote Nebraska and the sport of rodeo. The concept of Miss Rodeo America was developed in 1955 by a group of gentlemen under the name of International Rodeo Management (IRM). The same year, the town of Burwell, Neb. 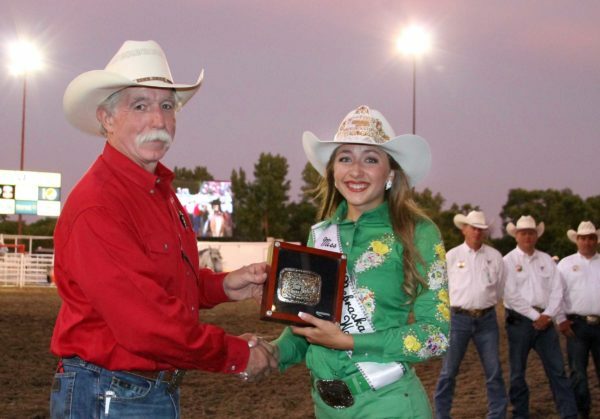 selected its first Miss Rodeo Nebraska: Dallas Hunt George of Lincoln, who held the MRN title in 1955 and 1956. She won the regional title in Omaha at the AK-SAR-BEN Rodeo in 1956 and went on to compete and win the Miss Rodeo America title in 1957. Laura (Lolly) Cameron Klug won the MRN title in 1957. 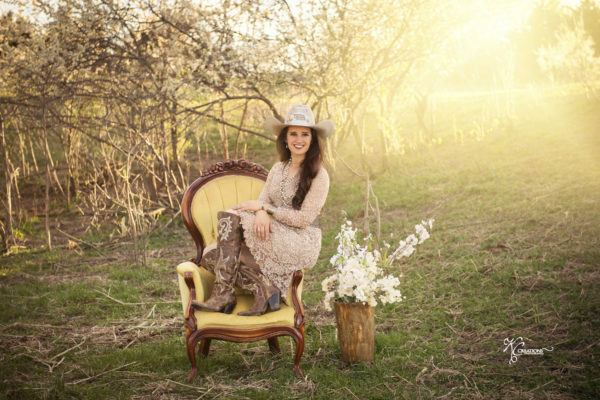 She also won the Regional title at AR-SAR-BEN and competed at the Miss Rodeo America Pageant. In 1959, she was named as the Buffalo Bill Rodeo Queen and given the title of Miss Rodeo Northwest. 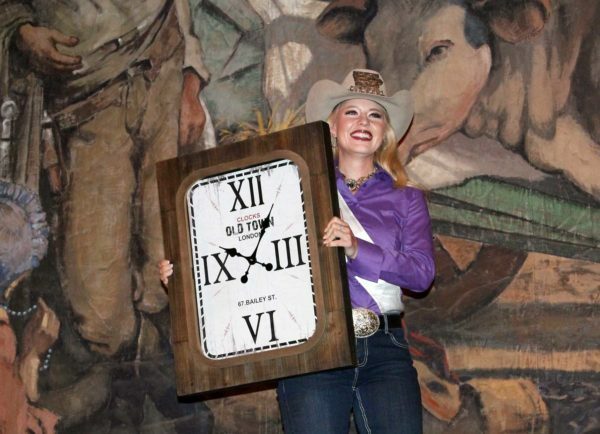 She then competed again at the Miss Rodeo America Pageant, where she was second runner-up. The MRN Pageant has continued every year since its humble beginnings. The goal of it is to select a young lady with the desire and enthusiasm to serve as a goodwill ambassador for the sport of rodeo and the state of Nebraska. In 1991, after Burwell had hosted the pageant for 36 years, the pageant was moved to North Platte so it could be presented in conjunction with Nebraska’s official state celebration, NEBRASKAland DAYS and the PRCA Buffalo Bill Rodeo. Also in 1991, NEBRASKAland DAYS started a tradition of presenting a $1,000 scholarship to newly crowned MRNs. The MRNA Scholarship Program has continued to grow and now awards more than $5,000 in scholarship money. In 2000, the pageant schedule was changed from three days to four days. 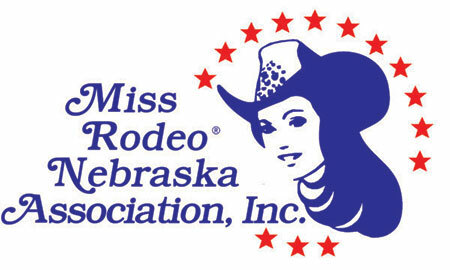 In 2006 the Miss Rodeo Nebraska Association, Inc. expanded its program to include the Miss Teen Rodeo Nebraska Pageant. We are so grateful to the many gracious sponsors who make the Miss Rodeo Nebraska program possible. We couldn’t do it without you! For more information about sponsorships, or to learn how to become a sponsor, contact Lacey Williams at laceyjane20@gmail.com, or Peggy Moorhead at moorhead@hersheytel.net. L & B Johnson, P.C. 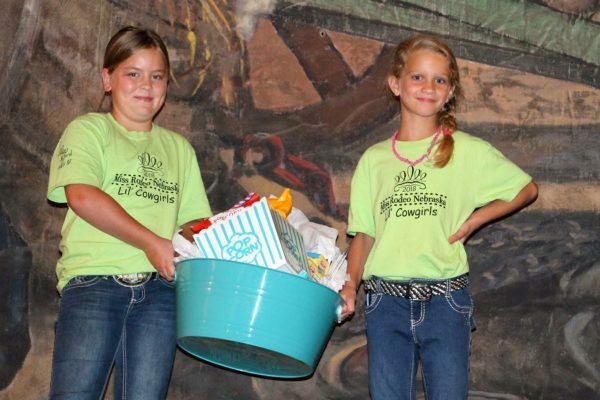 Do you have a little cowgirl, ages 6-11, who dreams of becoming a rodeo queen? Then she won’t want to miss this clinic! 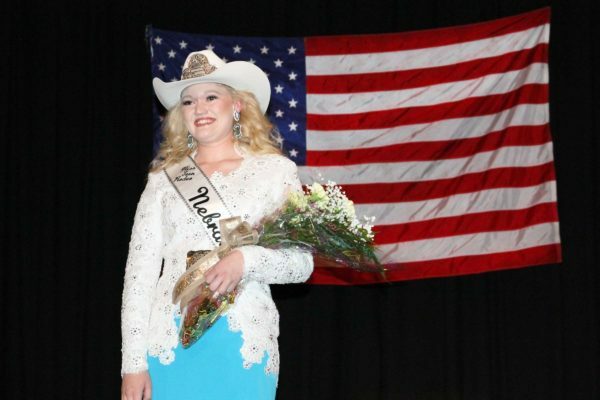 All little cowgirls are invited to the North Platte Community College South Campus, 601 W. State Farm Rd., on May 5 at 12:30 p.m. to learn about the ins and outs of pageants! The fee is $45. Registration forms must be mailed to Peggy Moorhead at 2609 S. Hershey-Dickens Rd., Hershey, NE 69143. Questions can be directed to moorhead@hersheytel.net. Hurry! The deadline to enter the Miss Rodeo Nebraska/Miss Teen Rodeo Nebraska Pageant is April 1! Their reigns may be over, but our former Miss Rodeo Nebraskas and Miss Teen Rodeo Nebraskas will never be forgotten. Click on the links below to see photos of previous leading ladies.